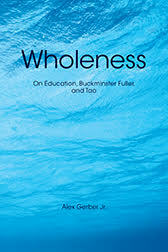 Wholeness literacy is described as "having practical tools for thinking and acting from wholeness perspective: what this means, why it matters, and how it relates in all aspects of our lives." * One of the eleven annotated, multimedia resources is Wholeness: On Education, Buckminster Fuller, and Tao. ✝ This is a phrase from Critical Path, by R. Buckminster Fuller. Wholeness suggests a way of being that honors the totality of life. When “parts” are overemphasized with little or no regard for the whole, the loss of unity and cohesion is reflected in declining personal, societal, and environmental health. Wholeness explores practical tools for thinking and acting from wholeness perspective—what this means, why it matters, and how it relates in all aspects of our lives. Wholeness is inherent; anyone can awaken to this reality/philosophy and realize its limitless value. This book pertains to personal awareness, the condition of planet Earth and its life forms, “humanity’s option for success” (Buckminster Fuller’s term), and the ineffable wonder of life. Though relevant to people in all walks of life, this book may be specifically useful in such fields as ecology, education, philosophy, intercultural relations, and design. Regarding the subtitle: Education is used in the broadest sense, encompassing not only formal education but also the lifelong process of experiencing and learning; Buckminster Fuller developed an expansive philosophy of wholeness with practical applications that are in accord with the environment; Tao is used to indicate the inexpressible. The greater complex is never predicted by the parts of the lesser complex. Therefore, I surmise that to learn anything you must start with the whole—with Universe. Comprehension of the whole alone leads to discovery of the significant intercomplementary functions to be played by the parts. Synergy—behavior of whole systems unpredicted by the behavior or integral characteristics of any parts of the system when the parts are considered only separately. To be optimally effective, undertake at outset the most comprehensive task in the most comprehensive and incisively detailed manner. Great knowledge sees all in one. Small knowledge breaks down into the many. Alex Gerber (Ph.D., University of Southern California) is an educator and musician living in Washington state. Established in 1989, Gerber Educational Resources is dedicated to the sharing of wholeness-oriented awareness and solutions. Publisher's note, 2018: Both publications are available by mail order. 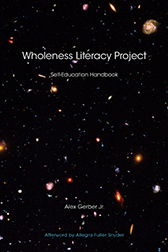 Online ordering, as well as an e-book of Wholeness Literacy Project: Self-Education Handbook, will be available soon (the e-book will cost the same as the printed version). © 2001, 2018 Alex Gerber Jr. All rights reserved. Reproduction, publication, and/or dissemination of the contents of this file are expressly prohibited without the prior written permission of Gerber Educational Resources.